Owner Don DiFrisco, a local real estate investor and entrepreneur, purchased the building in June 2015, and almost immediately, crews began renovations and haven't stopped since. I visited the new soon-to-open brewery recently, and while it's still a work-in-progress, all signs point to an impressive finished product. Before talking about my tour around the inside of the brewery and tasting room, let's get to the first question that's probably on everyone's minds: Where did the name come from? A local lake, Lake Hell 'n Blazes, inspired the name for the brewery. Local lore has it that early 20th century boaters had a "difficult," that is, a "hell and blazes" of a time navigating the "floating islands" of the lake. 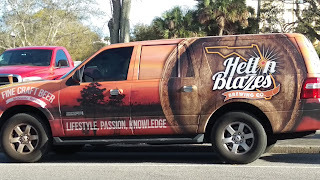 It's also been known as "Hellen Blazes" and, a nearby archaeological site, known as "Helen Blazes" (tempering down the term "hell" for those offended by it), has produced historic artifacts from the Archaic Period. The lake sits at the upper end of the northward-flowing St. Johns River in Brevard County, approximately 10 miles southwest of Melbourne. The name resonated with the brewery crew. There's also a sense of determination with the name, which became apparent during my tour of the brewery. Through the double doors of the brewery main entrance sits the large tasting room, which can accommodate around 300 guests. 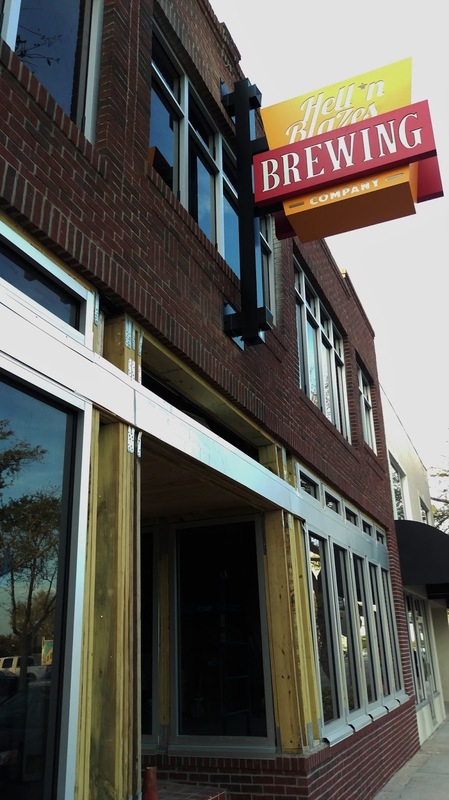 The first thing you'll notice is the large wraparound bar straight ahead, with a sightline view of the brewhouse behind a large glass window. The bar is embellished with cut wood logs, which is a tribute to the natural elements of Florida. The tasting room will include couches, tables and chairs, a standing bar rail, track lighting and TVs. And, thanks to General Manager Andy Pinkerton, I was able to get a "getting-closer-to-the-end-of-construction-are-we-there-yet" look at things. Thanks, Andy! Hey, Space Coast, you're gonna love this! Note the split wood log themed bar. Room with a brewhouse view. During my visit, contractors were still bustling around the building at the end of the day, and the brewery crew was busy working on the placement of the brewhouse equipment. There's a lot going on in here! The place is big: it's a 16,000 square-foot two-story building, with 8000 sf on each floor. The lower level is home to the brewhouse and tasting room. Administrative offices will be located on the second floor. They're going to have an awesome view of the brewhouse from up there, too, because the layout features a wraparound window design. There are quite a few engaging features in the decor. The brewery is keeping the history of the building alive with story-telling artwork along the back hallway (see upper right part of the above photo). Now, I couldn't give that story away by taking photos, but it's pretty cool. There are also photos of the Lake on the wall. During renovations, the crew found a number of artifacts from the days-gone-by, including morticians' tools. Right now, those are sitting in a glass cabinet upstairs, but it will be interesting to see where those land. Behind the tasting room is a 25x15 private tasting room/conference room, which includes the authentic safe from the bank era. Even the ceiling in the tasting room is the old tin ceiling from prior days. And, there's even a separate gameroom, where patrons will be able to enjoy table and arcade games and darts. Overall, what they've done here is mesh the industrial and historical past with a natural and modern vibe. All of that, and I haven't even mentioned the beer yet! You'll get your beer from the bar which will feature a poured concrete bar top and 10 draft line taps. Add in kegerators. The bar will also offer several guest beers. And, the beer? Sounds like there's going to be plenty. A 10-barrel oversized brewhouse anchors the brewery. And, here's what else is in there, along with a grain miller: six 20-bbl fermenters, five 10-bbl fermenters (170 barrel capacity); six 10-bbl brite tanks and three 20-bbl brite tanks (120 bbl capacity). And, for experimental brews, the guys have a half-barrel pilot system to try out some new stuff. It's a bright space, too, with skylights letting in the natural light. 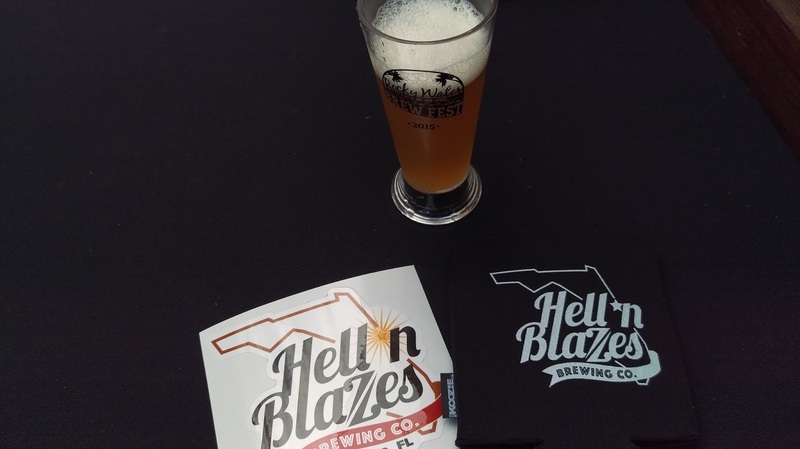 Not only has the crew at Hell 'n Blazes Brewing been busy with the construction phase of things, they have already offered their beer at several local beerfests, including Rocky Water Brew Fest (see my two prior blog posts about that one, by the way) and Space Coast Beer Fest (love this fest, even though I missed it this year). They have also participated in various open house events and beer tastings to let folks taste their brew. Coming up in November, the brewery will be featured at the first Downtown Melbourne Food and Wine Festival, in which it is also an event partner. The tap room is the focal point for the brewery, and while the door remains open to distribution down the (canning) line, for right now, it's all about the quality, getting it right the first time, and serving up some "helluva good beer" in what promises to be an amazing tasting room. The bar will also offer munchie-type and smaller food items, with local food delivery options. 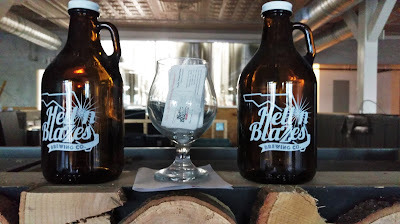 Growlers will be available, and they're even working on stainless growlers. The brewery is anticipating an opening in May, so stay tuned. 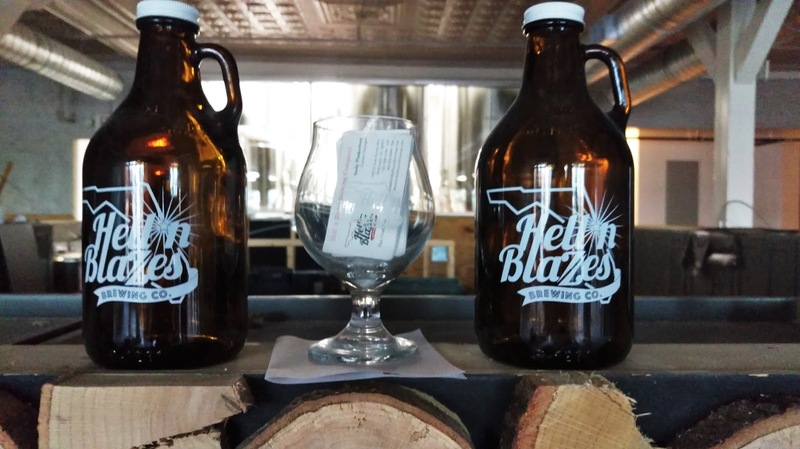 Hell 'n Blazes Brewing Company is located at the end of the historic downtown Melbourne district, just over the railroad tracks. I don't think you'll have too much trouble navigating your way here ... just follow what's sure to be a crowd, or look for that truck (above). See you guys in May! 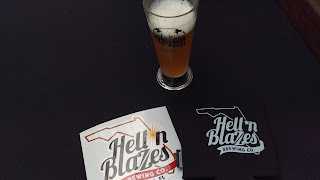 Yeah, I had a great time getting the tour of Hell 'n Blazes Brewing. Thanks again to the guys, especially Andy and Todd. 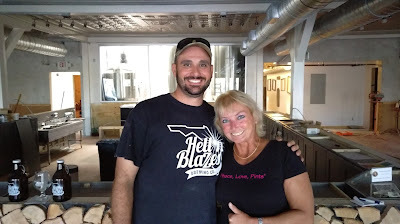 And, I even ran into Jimmy the next day at Intracoastal Brewing Company in the Eau Gallie District! Looking forward to my next visit to Melbourne and the Space Coast, so see you soon! In the meantime, you guys reading this know what to do: keep up with beer events via the Events page on this website, and, for those of you in North Florida, take a look at that daily beer calendar of events. I'll see you at a brewery, bar, restaurant, or event, so say Hi... but you might have to put up with a photo or two!